Enhance your bird garden with classic lines and colors using this Heartwood Old Waverly Bird House. This shelter brings wonderful detail and understated elegance to your bird sanctuary with ease. Crafted from cypress reclaimed from a 19th century building, the unit lends a timeless and environmentally friendly look to your setting. Its pitched, copper covered roof blends with the tan color of the home for a unified item, and routed lines on the front of the unit add texture. Visible knots and wood grain further the antique charm of this home, and the copper flashing on the roof will age over time for fantastic contrast. Birds can enter the home through the 1.5" diameter opening on this front panel, and the roof overhangs the entry to direct rain away from the nest. Drainage on the base also helps the nest remain dry, and the cypress construction helps regulate the internal temperature of the shelter. A cleanout disc on the back of the home removes for maintenance or cleaning, and the item is simple to place against a wall or other vertical surface with its attached hanger. The tan hue of the body furthers the natural hint, while the roof gleams in sunlight for exciting dimension. 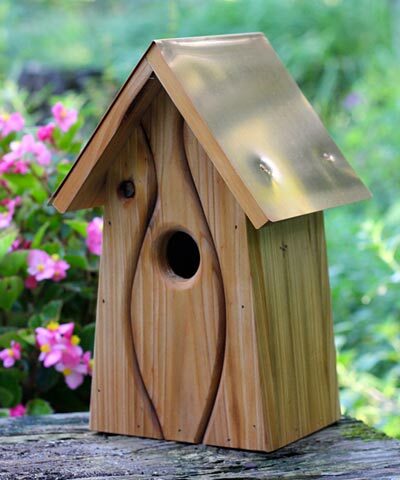 Provide your backyard birds their own charming, historic shelter by adding this Old Waverly Bird House to your garden. Made in the USA.